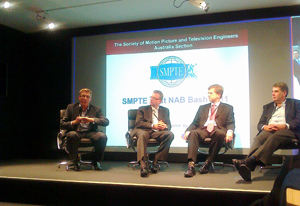 On the evening of Thursday the 5th of May more than 120 members and guests met in Sydney and Melbourne at the “Telstra Experience Centres” for the SMPTE Post NAB 2011 Bash. 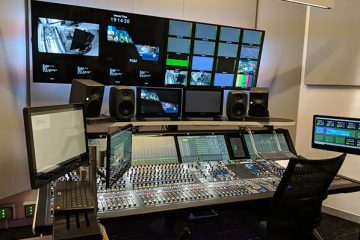 The objective of this annual event is for members of the industry, who attended NAB 2011, to brief the local film and television industry on the highlights, trends and quirky observations found at the NAB Show. 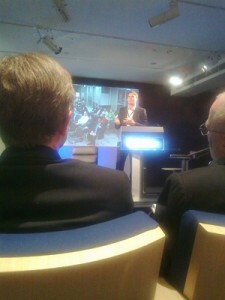 This year the event was jointly sponsored by Telstra International and Cisco Systems. John Nachef was the host and producer of the event, while John Maizels was the Master of Ceremony. An awesome video conferencing system and theatrette-style venues provided by Telstra enabled an active discussion between all participants in both states. The speakers included; Stuart Pointon, National Business Development Manager, Lemac; Trevor Bird, SMPTE Fellow, and General Manager – Group Technical Services for the Seven Television Network; Adam Wrightson, Executive Director and CTO of the Hoyts Cinema Technology Group and Christopher Stenhouse, CEO Switch Media. Sadly a regular speaker at the event, and larger than life personality, John Bowring ACS, passed away very suddenly in Hong Kong on the 16th of April 2011 on his return from NAB in Las Vegas. His significant contribution to past events, and the industry in general, was noted on the night – he will be missed. Looking ahead, the challenge will be to raise the bar even further next year by attempting wider membership engagement, eg. through national video streaming of the event. Then there was the after-party. Sponsored Storm FX a hardy crew “networked” into the night at a local watering hole, the Royal G.